Social media has taken its place within health care. The digital health movement promoted social media as a collaboration between patients, their caregivers, medical professionals, and other stakeholders in health. Social media introduces people to health information and health-preserving practices, connects patients and caregivers (who share common challenges), and provides an anonymous space for individuals for exploration of health concerns that could otherwise be stigmatizing. Social media allows patients and relatives to crowdfund expensive treatments and research their disease or encourage others to become donors for organ or bone marrow transplants. 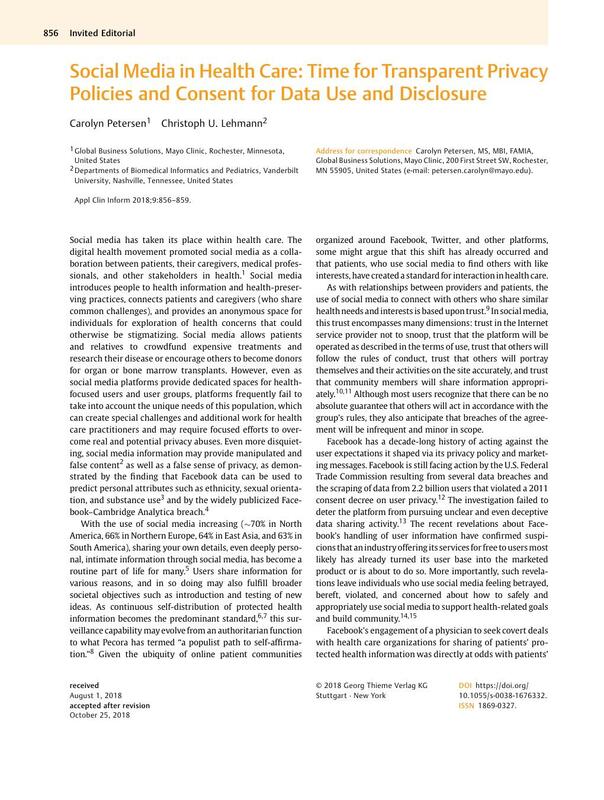 However, even as social media platforms provide dedicated spaces for health-focused users and user groups, platforms frequently fail to take into account the unique needs of this population, which can create special challenges and additional work for health care practitioners and may require focused efforts to overcome real and potential privacy abuses. Even more disquieting, social media information may provide manipulated and false content as well as a false sense of privacy, as demonstrated by the finding that Facebook data can be used to predict personal attributes such as ethnicity, sexual orientation, and substance use and by the widely publicized Facebook–Cambridge Analytica breach. With the use of social media increasing (∼70% in North America, 66% in Northern Europe, 64% in East Asia, and 63% in South America), sharing your own details, even deeply personal, intimate information through social media, has become a routine part of life for many. Users share information for various reasons, and in so doing may also fulfill broader societal objectives such as introduction and testing of new ideas. As continuous self-distribution of protected health information becomes the predominant standard,  this surveillance capability may evolve from an authoritarian function to what Pecora has termed “a populist path to self-affirmation.” Given the ubiquity of online patient communities organized around Facebook, Twitter, and other platforms, some might argue that this shift has already occurred and that patients, who use social media to find others with like interests, have created a standard for interaction in health care. Facebook's engagement of a physician to seek covert deals with health care organizations for sharing of patients' protected health information was directly at odds with patients' expectations of confidentiality for their health information. Though aggregation of information shared via Facebook with electronic health record data could provide insight for care providers seeking to improve patients' health, the creation and sharing of enhanced patient profiles are precariously left open to unlawful sharing of personal information, even social stigma and discrimination. Even users who are unaffected by Facebook's handling of private groups employ strategies to limit unwanted sharing of personal information. Users employ techniques that are preventive (e.g., signing up with false identities, managing friend lists to avoid sharing information with particular people), corrective (e.g., untagging), information control (e.g., self-censorship), and collaborative (i.e., comanaging with others the posting of information) strategies to avoid exposing personal information to people with whom they do not wish to share it. Some might argue that the practice of these evading strategies indicate that users understand and accept the limitations of privacy on social media platforms. However, use of privacy management strategies by individuals who lack local support for health-related needs (e.g., those with rare conditions, people who lack transportation to support groups, rural residents, those who have stigmatizing conditions, etc.) may reflect a forced tolerance rather than a warm embrace. Though Facebook's transgressions are perhaps the highest profile to date, the problems that have come to light on Facebook could occur on other social media platforms, and Facebook is hardly the only pain point for users. The Children's Online Privacy Protection Act, one of the more progressive laws covering Americans' personal information, stipulates data collection practices that are prohibited or require parental consent for users below 13 years. However, analysis of 5,855 of the most popular free apps aimed at children revealed that a majority failed to adequately disable tracking and behavioral advertising. Even more concerning, 19% of the apps use software development kits expressly prohibited for use in children's apps because they collect personally identifiable information. Americans are trained early to expect and tolerate illegal collection and distribution of personal information. It is tempting to think that data misuse can be ignored because breaches of privacy and confidentiality have been happening since the beginning of digital health care, and developers have yet to experience a significant backlash with patients fighting for their right to privacy. Rather, now is the time to proactively address privacy-related issues so that sources of patient-generated health data that hold promise for improved outcomes (e.g., electronic patient-reported outcome measures, wearables, remote sensors) remain acceptable to patients now and in the future. Creating a transparent environment in which social media platforms afford users the desired opportunities alongside known, manageable risks requires a twofold approach: a comprehensive consumer education campaign along with robust laws that motivate platform operators to implement user-friendly business models and policies. Public health campaigns focused on smoking cessation, seat belt use, and other health-enhancing behaviors have reduced unhealthy-harming behavior and improved health outcomes. The principles on which these campaigns were built (e.g., clear language, succinct messaging) may form the basis for initiatives that educate the public about thoughtful use of social media. Such campaigns could be made available in hospitals and clinics, community and senior centers, and other settings where patients or people who use social media congregate. Social media platforms will evolve as culture, market conditions, and laws change, but platforms are unlikely to go away, so the greatest good will come from approaching social media proactively. Because children are exposed to social media from an early age, social media awareness campaigns have an important role in middle school, secondary school, and university curricula. Age-appropriate information about how social media platforms work, options for sharing personal information, and what to do when things go wrong would prepare young people to become conscientious, meaningfully engaged participants in their health care as adults. Strong laws that incentivize development of user-friendly platforms with clearly stated data collection practices, use, and sharing policies will play a key role in promoting accountability among social media operators. A ruling by the European Court of Justice in 2014 afforded European citizens the “right to be forgotten.” The ruling does not require information to be deleted but requires removal of links from search results for a person. It created differences in international privacy rights, with far-reaching effects on companies such as Google and Facebook, which must treat users in Europe differently and comply with “delinking” requests. In the United States, tort law gives consumers strong protection against incorrect data collected and shared (like wrong credit information) but not against sharing of factually correct information. Legal protection against data collection of individuals in the United States is mainly directed at the federal government and not at companies or individuals. A comprehensive privacy protection system for the United States would include a “Right to be Forgotten” as well as regulation and oversight of data collection, analysis, and sharing practices. Social media companies, who use security practices to shield themselves from the exposure of their privacy violating practices, are vigorously fighting these initiatives. Health care is rapidly approaching a critical juncture: though people recognize that they can learn valuable information about maintaining their health and gain support for doing so through the use of social media, health care is in danger of patient rejection of these potential benefits in favor of achieving security of personal information. When social media platforms share information in ways users do not intend as a fundamental part of operations—as opposed to the more common practice of inducing users to agree to it through poorly designed interfaces, complex and confusing language, and privacy setting options that permit only various forms of sharing—users have little choice but to opt out of social media use entirely. Users of social media find themselves at a fork in the road: Leave social media or remain engaged? But perhaps there is a third option. Perhaps the path forward for the handling of private information in social media mirrors the way researchers are coming to approach the handling of genomic information: “The only path forward is to empower patients to choose the level of privacy they are comfortable with and then attempt to persuade them, one at a time, to make choices that will allow research to go forward.” With the passage of legislation prohibiting deceptive practices and the establishment of patient/consumer education campaigns that teach social media users to effectively assess the risks and benefits of social media use, patients will be in a position to use social media for their benefit, rather than primarily for the gain of profit-focused platforms. No human subjects were involved in the creation of this work, so no approval by an Institutional Review Board was required.